Anne of Green Gables The Sequel – The adventures of Anne Shirley continue! Anne of Green Gables is a story known by many and now this sequel takes us on the continued journey of Anne Shirley at Green Gables. It’s sort of like an update on her life and it gives us a glimpse of how she’s doing. Megan Follows continues as the lead character and what better person to be this character than Megan?! I’ve mentioned this before so I apologize if I’m rambling on but I truly believe she’s a superb actress. The Christian DVD Anne of Green Gables The Sequel follows Anne Shirley as she accepts a teaching post at a boarding school for girls in a town that’s basically led by a rich and conceited family whose apparent goal is to make Anne’s life miserable. Anne is now 16 years old and has been given a teacher’s license from Charlottetown Queens Academy. She has begun teaching at the local school so she can continue helping Marilla and the farm. She had been greatly ill but recently her health has become better which means that Anne can think back again on the whole college idea. Even though she likes teaching, her dream has always been to become a writer. But one day in Anne of Green Gables The Sequel, Anne sent a story she wrote called “Averil’s Atonement” but later receives a reject letter. This experience leaver her feeling horrible and she thinks that her dream of becoming a writer will never come true. Later, her friend Gilbert Blythe tells Anne that her friend Diana is engaged to Fred Wright. You’d think Anne would be happy for her friend but in fact, she is quite shocked as she thinks that engagement is impulsive. At Diana and Fred’s engagement party, Gilbert proposes to Anne unexpectedly and she rejects him, thinking that a life alongside him wouldn’t be a happy one. Now wanting to do something different with her life, Anne researches a teaching position that is offered to her by her previous teacher Miss Stacey. She thinks about it and accepts so now she’s a teacher at Kingsport Ladies’ College. 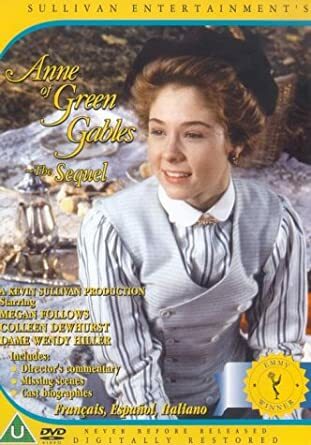 Anne from the Christian DVD Anne of Green Gables The Sequel is eager to begin this experience and learn from it. Anne arrives at Kingsport not really knowing what tension was waiting for her. It turns out that a member of the esteemed Pringle family applied for that same position and was rejected. The Pringles are quite a force in Kingston so there’s this strife between the Pringles and Anne. At school, it looks like almost every student is out to make her job even more difficult but she is determined to make things right. Anne from Anne of Green Gables The Sequel continues on despite everything and soon she gains the respect of everybody with her dedication towards her job. She, later on, puts on a play with her students that is greatly received from everybody in the community. Soon in the Christian DVD Anne of Green Gables The Sequel, Anne’s dream of becoming a published author comes true when a series of short stories she’d written are published. Gilbert was actually the one who encouraged her to write these. Things are looking up for Anne in Kingsport, she’s happy and feels like she’s making a difference. One of Anne’s students Emmeline Harris becomes very close to her. Emmeline explains to her teacher about her living experience at home as she lives with her aunt and with her hypochondriac grandmother. Since the grandmother has that specific condition, aunt Pauline has become somewhat of a prisoner in her own house. Also, she doesn’t want to leave because she’s scared something bad will happen if she goes away. Anne listens to her student and really wants to help so she chooses to stay with Emmeline’s grandmother and with her bright light and positivity is able to make a change in the grandmother. Also becoming closer to Anne in this Christian DVD is Mr. Morgan Harris, Emmeline’s father. So now that they have become close, she heads alongside Mr. Harris and Emmeline to see his new house in Boston. Emmeline longs to have a deeper relationship with her father but he usually puts his job first. Hearing this, Anne has a talk with Mr. Harris encouraging him to spend more time with his daughter. Soon Mr. Harris has a special question for Anne that she’ll not expect. The Christian DVD Anne of Green Gables The Sequel is available for purchase at the Fishflix store!